Thanks to CM Cheh for sponsoring and CMs Mendelson, Bonds, Silverman, RWhite, Nadeau, Allen, Gray, TWhite for cosponsoring legislation to assure independent education data! On April 10, Ward 3 Councilmember Mary Cheh introduced a bill to establish an office for independent education research, cosponsored by the CM’s above. The proposed legislation would create an education research office, based, at least initially, in the Office of the Auditor. In DC, the Auditor’s office functions much like the federal government’s General Accountability Office or Congressional Research Service, providing independent data and reports on key issues. The first tasks of the new office include identifying and rectifying any data holes, vetting the accuracy of existing data, and undertaking initial research projects. Listen here to DC’s Auditor and Deputy Mayor for Education discuss this issue on the Kojo show. I hope the research work will follow the model of the Chicago Consortium on School Reform (CCSR), in which the research is undertaken in deliberate partnership with educational partners (In our case, it could be DC Public Schools, Public Charter School Board, individual or groups of charter or DCPS schools, etc.). The research would provide partners with real-time data and analysis to understand how well and why a given initiative is faring–for example, a specific literacy initiative; approaches to credit recovery; or a new policy, such as the proposed bill limiting suspensions. Hearings on the bill will be held this summer/fall, amendments will presumably be made, and hopefully a bill embodying these ideas will be adopted before the end of the calendar year. Meanwhile, it’s important that the upcoming budget provide some initial start up funding so that this office can get set up and be ready to go. This initiative will help rectify one problem with DC’s mayoral control that is unique to DC—the lack of independent data. In the wake of our various crises, I have reviewed “mayoral control” initiatives around the country. It turns out that our particular form of mayoral control is the only one that vests this much unchecked authority and power over data in the mayor. In every other jurisdiction where the schools are controlled and overseen by the mayor, the mayorally-controlled school district is still subject to some regulation and oversight by a state education agency that is independent of the mayor. Only in DC, do we have a system in which the mayor appoints both the chancellor of the local school district (DCPS) and the superintendent of the state agency (OSSE). It is no disparagement of any individual to note that this is an unwholesome system that violates the principles of checks and balances. It’s a bit of the fox guarding the chicken house. And, at this point, the information and actions that flow from this arrangement lack credibility. When it was discovered that so many (one-third) of last year’s graduates hadn’t met basic graduation standards while the mayor and her appointees were promoting the city’s ever-higher grad rates, many observers unsurprisingly believed that the numbers had been spun. More recently, when an investigation of residency fraud seemed to be moving slowly at OSSE, there was speculation that it was being “slow-walked” by the agency’s lawyers. True or not, the current arrangement can’t produce data that is regarded as credible. The failure is not personal, it’s systemic. The proposed education office, which will be independent of mayoral control, will be a source of vetted, credible, unspun data. Budget season is underway. The mayor has proposed a substantial increase in the per student funding payment, thankfully much above her proposal last year which was for a preposterously low 1.5%. (The DC council ended up raising it.) But, this year, schools must use the new dollars to cover the salary increase that was negotiated for staff last year—the first such in 5 years. Schools are now figuring out how far the dollars will stretch and working with the school district on how to allocate them. School discretion, transparency, central office bloat, at-risk dollars continue as issues needing work! Really: “One-size-fits-all” doesn’t help Wilson and it doesn’t help other schools, not here in Ward 3 and not anywhere else in the city. I probably hear about this issue more than any other, from parents, LSAT members, PTO leaders, and school staff at every level. There’s always a balance between what needs to be centralized and what should be left to school discretion. But the balance here is seriously out of whack. One result is a tremendously bloated central office, explained in this City Paper article. During the last year, under the previous chancellor, Antwan Wilson, there was a move to give schools greater discretion and autonomy. It was a welcome development. Let’s hope the movement continues! Steps were also being taken towards making the whole DCPS budget process more transparent; as it is, it is often not clear why particular schools are funded at vastly different levels; why particular programs get funded at a given school and not others; and what’s happening with at-risk dollars. (See this WP article on the year after year problem with schools having to use their at risk dollars to fund basic school programs.) Greater transparency would produce greater understanding and credibility—and a needed opportunity for democratic discussion about priorities. For a wonderful look at how DCPS budget dollars get distributed to schools, take a look at this very cool budget tool, organized and assembled by volunteers from C4DC (Coalition for DC Public Schools and Communities) affiliates and Code for DC. Adding space to Key and Stoddert! Congratulations to Stoddert and Key for getting commitments in the budget to build permanent additions to their schools! And, many thanks to DCPS for supporting these additions. These two schools have had growing populations for years, with more and more students going to class in trailers that have been increasingly overcrowded (and increasingly old!). Last year, DCPS convened a Community Working Group including the principal and a parent from each Ward3/Wilson feeder school; in addition, I am on it, along with Brian Doyle, chair of the W3/Wilson Feeder Education Network and Michael Porcello, representing CM Cheh. The group’s purpose was to make recommendations on how to address overcrowding in the schools, which is projected to get worse in coming years. The group was to have issued recommendations earlier this year, but the exit of Chancellor Wilson has apparently stalled the process. Additions for these two schools are important, needed remedies. But the problem is also much bigger—Wilson’s enrollment is up nearly 150 from last year’s projection and Deal is getting a new double decker trailer to accommodate its students! Projections show continued, substantial enrollment growth in W3 elementary schools. It’s critical that DCPS continue its very welcome effort to address these school capacity issues. For more info, see Working Group Notes. NAEP shows educational stagnation—in DC and the nation. The results of the biennial National Assessment of Education Progress (NAEP) math and reading tests were reported earlier this month. Nationally, the results were distressing, indicating that in 4th and 8th grade math, achievement levels have not grown at all in the past two years. In reading, the 4th grade scores were down one point; in 8th grade reading, though the scores were up two since 2015, they were still a point behind where they were in 2013. In DC, the results were likewise disheartening, with scores for 4th and 8th grade reading and 4th grade math mainly plateauing; DC’s 8th grade math scores were up by 3pts. 2. Greater reliance on “leveled books,” which seek to grow student achievement by matching students with books on “their level.” But these less advanced books limit the subject matter and vocabulary weaker readers get exposed to; and this in turn limits the growth in students’ background knowledge and puts a cap on their later reading comprehension ability. For more on this topic, which is a great passion of mine, see this backgrounder. from Knowledge Matters Campaign (Note: I am a supporter and sometimes contributor to this group! ), this excellent article from the Atlantic, and the full video of the reading experts on NAEP day. I appreciate that DCPS (more than many other districts) has tried to counter the trend to deemphasize social studies and science; it has supported the development of Cornerstone units and other curricular materials to encourage and support teaching in these subjects. But, as long as ratings (of both schools and teachers) are based so heavily on reading and math test scores, actual practice is unlikely to change. I hope that the findings of these reading experts will help lead education leaders nationally and in DC to better understand the unintended consequences of accountability policies that are so narrowly focused on reading and math test scores–and take steps to mitigate them. Take this survey on the School Report Card! Regular readers know that DC has been working to create a new school report card that will let parents and policymakers to make apples to apples comparisons among schools across the city. By DC law, OSSE must make the proposal, the public has an opportunity to weigh in, and the State Board of Education (SBOE) votes the proposal up or down. In addition, an SBOE Task Force has been reviewing the issue. At this point, the decisions the report card’s content have been made. All that’s left is decisions about the presentation—what will it look like, what content will be emphasized, etc. One concern raised many times, including by members of the SBOE task force: Every single page highlights the number of stars the school has earned under the report card’s 5-star rating system. As several folks have noted: The 5-star rating is almost entirely based on reading and math test scores (sound familiar as a source of declining scores?!) But the report card itself includes information on a variety of other issues. Why should the star rating appear on a page that is about school programs? Doing so conveys the idea that the star rating reflects a judgment about those programs when it doesn’t. I urge you to take a look and weigh in with this online survey. The survey won’t specifically ask about this issue, but it includes space for comments. Due by May 4. As Deal parents already know, acting-Principal Diedre Neal is now just plain Principal Neal. Neal took over when Principal James Albright left Deal after last school year, for health reasons. Initially she was named acting principal. The parents I spoke with hoped she would become permanent, and DCPS just made it official. My personal note: Then-Assistant Principal Neal was the AP for Deal’s first 6th grade, in which my child was a student. She provided us with enormous, needed support, and we will both be forever grateful. The Beacon, Wilson’s student paper has been hitting new highs with its reporting on conditions at Wilson, schools around the city, and much else. It was highlighted in the Forest Hills Connection and its article on metal detectors ran in the Northwest Current. Recent articles addressed security concerns, the predicament of Wilson’s out-of-bounds students, and changes to the teacher evaluation system in the wake of the graduation crisis. It’s some of the best reporting on DCPS in the city! Subscribe here. Students: Join State Board of Education Advisory Committee/Serve as a member of SBOE. The DC State Board of Education (SBOE) seeks motivated students in the District to serve as Student Representatives on the State Board and as members of our Student Advisory Committee (SAC) next year. Applications are now being accepted from students who are passionate about serving their local community. Students will have the opportunity to represent their peers in the decision-making process for education policy in the District. Interested students can apply online at bit.ly/SBOEStudentRep. The application is due by Thursday, May 31, 2018. Teachers/Students/School Staff: Send a letter to City Paper about your experiences. From City Paper: Do you have something to say about D.C.’s public schools or charter schools? Consider submitting a public letter to the interim chancellor or to the DC Public Charter School Board. Email your letter to editor@washingtoncitypaper.com. City Paper will publish select letters and verify the identity of their writers. We are most interested in hearing from people who spend their days inside school buildings, either as staff or students. We will offer anonymity upon request. Note from me: While City Paper is most interested in first person comments from inside the building—thus the focus on teachers and students—they are open to interesting accounts from parents as well. Enjoy spring, while it lasts! …… And, as always, if you have thoughts on the above suggestions or anything else, please email me, ruth4schools@yahoo.com. Thank you for having this important discussion. The argument for mayoral control is that greater, focused accountability leads to greater results. Well, if that was true, it wouldn’t have been a young reporter from WAMU who told us the truth about our grad rate. The mayor would be in a competitive election defending–or revising–her educational plan. It has not worked as hoped. I am not for “going back.” But I am not for staying a course that is not working for our kids. Minimally, this particular form of mayor control and this particular form of education reform are not working as we hoped. It need not be all or nothing. There are things that can be fixed in the short term; others in the longer term. Mayoral control of school districts is NOT the norm. Of the thousand largest school districts, only 15 are under mayoral control. Almost nowhere is this regarded as desirable. We are unique even among mayor-controlled districts for the unchecked power we give our mayor, over policy and information. Every other such district is part of a state. These districts are supported and overseen by politically independent state education agencies run by politically independent state superintendents, overseen by State Boards of Education. The state superintendent is named by and responsible to the Board, governor or some combination of the two—not to the same mayor who appoints the district chancellor. Under our structure—and only ours–there is no independent entity that vets data or conducts independent evaluation. Data can be spun, go uncollected or unreported; investigations can be partial or slow walked. Information lives in a silo. It is no slight on the integrity of any individual to acknowledge the conflicts this creates in reality and perception. We have no checks and balances. At the very least, data, evaluation, investigations should be spun out of the mayor’s orbit. I hope the Council will insist on establishing an independent research entity, perhaps like the Chicago Consortium on School Reform, that will help us understand what works and what doesn’t. We are unique in the lack of voice for DCPS parents and residents. In virtually every other mayoral control district, there is still a school board. It may have limited or broad powers. Members may be wholly or partly appointed by the mayor, county exec, or governor. But there isa board. It meets regularly, publicly. In some places, it has the same powers as any other local school board. The chancellor reports on key issues. Data gets reviewed. Board members ask questions. Parents, teachers, and students testify. The media covers it. Skepticism gets a voice. Issues get vetted. Policy discussions break out of the silo. DCPS families have no such local school board forum. Despite great efforts and intent, a small number of education committee hearings a year on general issues are no replacement for a chancellor regularly, publicly facing stakeholders and board members on a full range of issues. It is inconceivable to me that, with even that regular scrutiny, the mass promotions and graduations of unready kids–and the pressure on teachers and principals that led to it–would have happened as they did. Nor would the high levels of turnover and unfunded, cookie-cutter mandates be tolerated. Finally, we are unique in that the rules governing the coordination and competition of our charters and traditional schools were largely imposed on us by a Congress that we did not elect. And our elected officials, apart from the mayor, have virtually no say in how this two sector system functions. Most people in this cityappreciate thatwe have charter schools—which can provide innovative options and alternatives. But most people also, maybe more fervently, want a system of strong, neighborhood, by-right schools. In other mayoral control cities, the council, voters, parents have a way to influence rules of competition between charters and neighborhood schools that can assure the viability of both. We don’t and the neighborhood system and neighborhoods are suffering. We have made progress. We don’t want to throw out the baby with the bathwater. But let’s recognize: some of that bathwater is very dirty.Absolute power is not healthy. Silo’ed information leads people to believe their own good PR—and not undertake the evaluation, discussion, and modification that is necessary in any school reform. We need checks and balances. We don’t need to go back to the past. But it is irresponsible to stay put when so much is not working as we want. Finally, I hope that in addition to any legislative work you do, you will insist in the short term on a citywide discussion about the direction of DCPS in connection with the selection of a new chancellor. So, when DC officials reported the test scores of the city’s disadvantaged students this summer and included all of Deal’s students in that category, the scores were, not surprisingly, higher than they would otherwise have been. Likewise, when the coding error was discovered and the scores corrected, the overall portion of disadvantaged DC students who had reached proficiency dropped. The Washington Postreported this on October 5th and the Office of the State Superintendent of Education (OSSE—DC’s state education agency) and DCPS have made corrections on their websites. But here’s what’s most interesting to me. In a very large number of DC schools, all students, regardless of their income, are regularly and routinely classified as “economically disadvantaged”for the purposes of reporting test scores. In other words: What is a coding error at one school is the accepted, standard practice for other schools. That’s because if 30/40% or more of a school’s students are eligible for free or reduced lunch based on their family’s income, the entire school can opt to provide a free lunch to all students. This option, known as “community eligibility,” makes total sense; it allows schools to lower the administrative costs/bureaucracy/stigma of identifying and overseeing a system in which some kids in a school get a free or reduced lunch and others don’t. The problem is with the test score reporting; when these students are categorized as “economically disadvantaged,” it means reports about the scores are misleading. My SBOE colleagues, Joe Weedon and Jack Jacobson, explained this in this Greater Greater Washington post. This is one important way in which the reporting of test score data ends up being misleading. For other ways, see this Washington Post op-e d. that I wrote last year about the test score problems at Wilson High School. November 5, Newsletter from Ruth Wattenberg, Ward 3 Member, DC State Board of Education. Click to subscribe. Wilson budget: Thanks to Chancellor Wilson and DCPS for restoring the staff positions cut this spring! 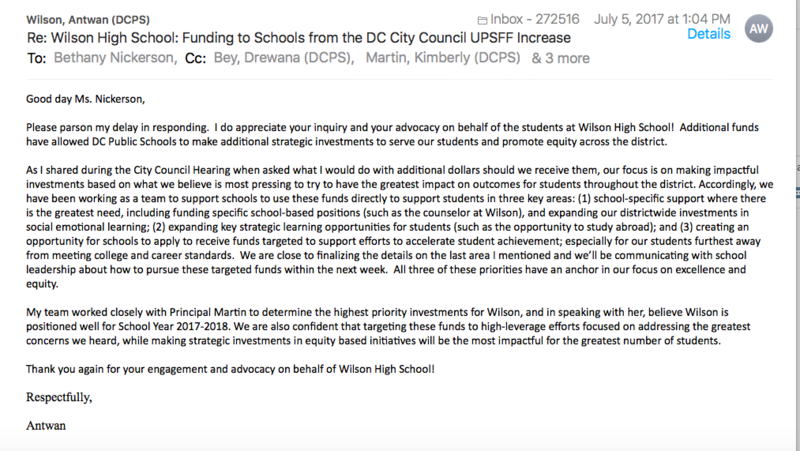 Anybody who reads this newsletter knows that I have been extremely critical of DC Public Schools (DCPS) for its budgeting practices–and especially for the repeated, 3-years-in-a-row staff cuts at Wilson High School, totaling some 30 staff cuts over three years. Kudos and thanks as well to the community that cares so much about Wilson. Many, many parents, students, and community members wrote, emailed, and called the Chancellor, the Mayor, the Deputy Mayor and members of the City Council. Wilson’s PTSO and LSAT leaders testified before the Council and wrote letters and called throughout the summer. Ward 3 Councilwoman Mary Cheh was tireless in pressing the issue. A very welcome beginning… but, just a beginning! This is an important, very welcome start! That said, Wilson was understaffed when it opened in the fall–hiring to make up for the cuts is still underway–all the positions aren’t permanent, and Wilson is still down about 20 staff over three years, despite higher enrollment (1793 in spring 2015;1835 today.). But fingers crossed, I am hopeful that in this next budget cycle, Wilson’s overall staff situation will be addressed–and that the broader broken budget process, in which inaccurate budget projections lead to reduced budgets that never get remedied (for all schools, not just Wilson! ), will be fixed. I’ll keep you posted. Speaking of the budget…. DCPS will hold its first Budget Hearing for the new fiscal year on Tuesday. If you are interested in testifying, register online no later than 3 pm, Friday, November 10. For questions/concerns, contact the DCPS School Funding Team: (202) 442-5112 or dcps.schoolfunding@dc.gov. I encourage you to attend! ***Monday, January 9, 6-7:30PM, Lafayette ES, 5701 Broad Branch Rd. ***Monday, February 6, 8:45AM-10 am, Oyster-Adams, 2801 Calvert St. The topic: The state of special education services in DC’s traditional and public charter schools and OSSE’s implementation report on the “Enhanced Special Education Services Act of 2014. To testify, sign-up online or call the Committee at (202) 724-8061 by 5:00pm Thursday, November 16. 2017. Apply: Student/Parent Advisory Committee, Office of the Student Advocate. The Office of the Student Advocate, housed at the State Board of Education, is charged with supporting families in their efforts to navigate the complexities of the DC public education system, including developing resources and boosting parent engagement. To aid its efforts, the office is launching the Parent and Student Advisory Committee. For more information on the Advisory committee, click here. To apply, click here. What do you want to know about your school? DC is developing a new “school report card,” as required by the federal Every Student Succeeds Act (ESSA). This new report card will, for the first time, be common across traditional DC Public Schools (DCPS) and charter schools. It will allow parents to compare schools “apples to apples.” As importantly, it will give parents the info they need to have useful conversations about the strengths and needs of their children’s schools. What must the Report Card include? As many of you know, starting next fall, every DC public school will be evaluated based on a new rating system that will grade each school with 1-5 stars. The number of stars a school gets will be based mainly on whether students reach specific test score thresholds. The remainder is based mainly on attendance, re-enrollment rates, and English-learning progress among limited-English speakers. In high school, the rating will also be based on the percent of students who graduate and take advanced courses [Advanced Placement (AP) and International Baccalaureate (IB)]. In k-8 schools, a small amount will reflect how much students’ test scores increased relative to similar students. The report card must also include such required information as per-student funding (provided by government sources); # of suspensions/expulsions; and the number of teachers who are inexperienced, on emergency credentials, uncertified in the subject they’re teaching. What should the Report include? What else would provide parents, educators, and policymakers the most useful, accurate view of our schools? What do you want to see on the report card? See below to take the survey and for information on focus groups that you can attend. Here are a few of my favorite ideas. They mainly reflect some of the most common requests that were expressed to the State Board of Education during the city’s debate about ESSA last spring. 1. Let’s highlight the “growth” made by a school’s students, so that a school’s progress isn’t masked by the heavily income-correlated STAR ratings. Almost every aspect of the STAR rating tells us more about the affluence of students’ families than what students have learned or school quality. In terms of test scores, consider this: Low-income students typically begin the school year multiple grades behind their more advantaged peers. Even if a school full of students with very low initial scores improve their average achievement by well over a full grade—let’s say a grade-and-a-half or even a huge two full years!—that school’s students are still unlikely to reach the test score thresholds that would earn the school a high STAR rating. This means that the STAR rating will almost certainly award the largest number of stars to the schools with the highest-income students and the smallest number to schools with the lowest-income students. A poor rating for these schools, even though they may be effective, could and likely will lead families to avoid them, possibly leading to enrollment and budget drop-offs, causing great harm to effective schools and the students who attend them. But, if we highlight the growth students make, not just whether they meet a certain score threshold, we would reduce this unfortunate problem. 2. Let’s highlight the attention elementary schools give to social studies, science, and the arts. The STAR rating holds schools accountable for an important, but very narrow, band of outcomes: mainly math and reading scores—sometimes to the disadvantage of other subjects and school goals. I have heard many, many complaints about this, especially at the elementary level, where protected time for social studies, science, and the arts isn’t typically provided. Research literature also speaks to the damage done by curriculum-narrowing. The report card is our chance to encourage our schools to focus on a broad rich curriculum. One idea: elementary schools should report how much time per week students spend on these subjects. 4. Health information: I hear a lot of interest from parents in having access to health information: For example, does the school have a full-time nurse? How much time is devoted to recess and physical education? Are the lunches nutritious? 5. Beyond school quality and effectiveness, schools have strengths, weaknesses, and offerings that may be of great interest to parents. Does it have a special curricular focus? What clubs/teams are available? Does it offer an after-school program? How much emphasis is put on test preparation Do students go on field trips? What’s your view? Please take this survey. Plus, the State Board’s ESSA Task Force, State Board members, and OSSE are scheduling community feedback meetings around the city. I’ll be leading a session hosted at Hardy Middle School on November 16 at 7pm. To register, click here. In addition, I’m meeting (or met with) with PTSO’s and/or LSAT’s at Janney, Wilson, and Eaton and would be very happy to schedule meetings at other schools as well. Let me know if you’d like to be part of such a discussion. See here and here for a list of additional focus groups around the city. And, as always, if you have thoughts on the above suggestions or anything else, please email me, ruth4schools@yahoo.com. I’m off to visit the leaves in West Virginia! Happy Fall!!!! Enough with the mandates and rosy data. Our recommendations for really raising student achievement. “Most people don’t realize it, but the high schools in Wards 8 and 3—Anacostia, Ballou, and Wilson—and the elementary and middle schools that “feed their students to these schools enroll a near-majority of all students in DCPS neighborhood schools. In the school year that just ended, there wee 9144 students enrolled in those Ward 8 schools and 9703 in Ward 3’s. Citywide, DCPS neighborhood schools enrolled 43,389. It’s no secret that Ward 8 is the lowest-income ward and Ward 3 the highest. They are two very different communities, with divergent student and family populations. Nonetheless, and perhaps surprisingly to some, our concerns about our schools—in Wards 8 and 3, respectively, where we are the elected State Board of Education members–and for the system as a whole are quite similar. As Board members, we have a special opportunity to meet, visit, and interact regularly with the families, teachers, principals, and staff who depend on and work in the DCPS schools across the city. “Solutions to one perceived set of problems have a way of producing a new generation of problems. So it is with our school system. As our new chancellor prepares to release his new strategic plan in the next few weeks, he faces a different set of challenges from his predecessors. And so his agenda must be distinct. We are optimistic about the leadership and ideas that Chancellor Antwan Wilson is bringing to our schools, but we have some advice. “The past two chancellors inherited a school system suffering from horribly low student achievement. They were charged with taking urgent action. As they saw it, the core of the problem behind low achievement was inadequate teachers and principals—and, more broadly, a culture of low expectations where poverty was blamed for students’ failure. The reform agenda of these chancellors was clear: There was a laser-focus on identifying and removing inadequate teachers and principals and replacing them with better ones. The relatively lax system was tightened with a stream of mandates from central office. Evaluation criteria emphasized test scores and adherence to particular teaching and operating approaches. For a long time, a high-quality curriculum was an afterthought. “How successful this agenda has been is subject to debate. While average scores have risen, leading the district to be “the fastest growing urban school district in the country,” the rise is at least partly due to gentrification: The 8th grade reading and math scores of our poorest students have hardly budged. After 10 years of aggressive education reform under Mayoral control, the achievement and opportunity gaps across race and wealth have gotten wider. “Therefore, the DCPS reform agenda must change. There is consensus that successful schools—especially those with the lowest-income children—have, and depend on strong, supportive, trusting school cultures in which staff members hold high expectations for all students; where all staff are constantly improving and encouraged to recognize, understand and solve problems that are impeding achievement. Such schools can thrive only in districts that give them the autonomy to do what’s needed –and where data and research, good and bad, are transparent and welcome because they show whether progress is actually being made or whether improvement strategies need to be adjusted..…. 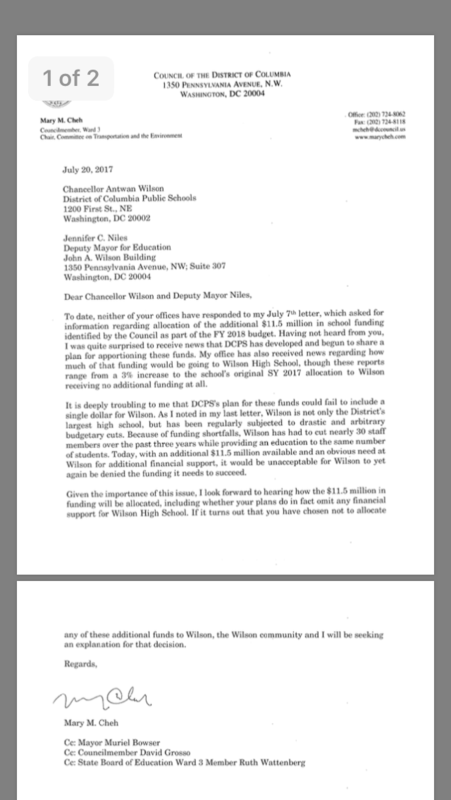 Email Mayor eom@dc.gov, Deputy Mayor for education dme@dc.gov, about unrelenting staff cuts at Wilson. ccruth4schools@yahoo.com. Details below; scroll down for City Council addresses. Also, scroll down for information on: new ESSA Task force; Chancellor Wilson on Social-emotional learning; survey for Wilson feeder school families on space/overcrowding; DC’s extremely high teacher turn-over rates are much higher than in other urban districts. Last spring, the Mayor proposed a city budget that dramatically underfunded the city’s schools. As a result of the underfunding, DC Public Schools (DCPS) cut the 2017-18 budgets of schools across the city. The cuts sparked huge opposition, with many people on this list emailing, calling, and visiting their City Council members. The DC Council scraped funds from other parts of the budget and voted to increase per-student funding by 3%–compared to the Mayor’s inadequate, below-inflation increase of 2%. The chancellor has emailed Bethany Nickerson, the chair of Wilson’s Local School Advisory Team (LSAT), writing that he believes “Wilson is positioned well for School Year 2017-18” and that the additional funds will be targeted instead to a variety of DCPS initiatives. In fact, Wilson is not well positioned. It has lost over 30 positions in 3 years, with no significant decline in enrollment (see below). And, the council was clear: The extra funding was intended to allow schools to restore staff and programs that had been cut. Unlike in most of the country, DC schools are under mayoral control. It’s important for her to understand the issues. Dep. Mayor for Education Niles, dme@dc.gov. It is unclear what is driving these cuts. Sometimes officials with DC Public Schools or the Mayor’s office have argued that the staff cuts are due to enrollment cuts. But over these same three years, Wilson’s enrollment has remained essentially stable. Enrollment in 2014-15 was 1788. Enrollment on “audit” day this past October, 2016, was 1749. Actual enrollment this past April 20 was 1806. DCPS’s official projected enrollment for next year (almost surely underestimated) is 1745. Many parents believe, based on the large class coming in from Deal, that Wilson’s actual enrollment next year is likely to exceed 1800. Regardless of which numbers you use, enrollment has declined by 43 at most, or has increased, using this spring’s actual enrollment, by 18. The fact is: Wilson has lost nearly a full staff person or more for each 1-student decline in enrollment. Thanks for lending your voice! Apply here. Deadline Monday, July 24, at noon. As readers of this newsletter know, this spring the DC State Board of Education adopted a new plan for judging the quality of DC’s public schools. But the new plan is intended to be a first strong step towards a better accountability system, not the final word. The SBOE is convening a public task force to advise it on further improvement and changes. If you haven’t yet filled out a survey on the space/overcrowding challenges faced by your school, please click here and get your survey in to DCPS. These surveys are helping DCPS and a community Task Force (made up of parents and principals from each Wilson feeder school, the chair of the W3/Wilson Feeder Education Network, a representative from CM Mary Cheh’s office, and me) develop recommendations for alleviating the current and future overcrowding that our schools face. Unless the City Council intervenes in a big way, our schools will be badly hurt by the Mayor’s proposed education budget. This will be the third straight year in which per student funding for public schools will decline in real terms. Because of the way DC Public Schools (DCPS) allocates funds to schools, the most severe effects are felt by the largest schools, at all grade levels. At Wilson High School, the citywide high school located here in ward 3, eight staff will be cut, including two counselors. This is on top of 9 staff cut last year and 12 the year before: A total of 29 staff cut in three years. These cuts will affect schools across the city. At the only somewhat smaller Columbia Heights Education Campus, 5 staff are being cut. At Eastern and Ballou, two other large high schools, schools are losing some combination of teachers, counselors, art programming, office and custodial staff. This is a key time to tell members of the City Council that the proposed education budget must be raised and that new funds must get to the schools that are most affected. 1.Please sign this petition, which will be submitted to the Council, calling for the full 3.5% increase and an assurance that added funds are allocated directly to schools, especially those that have been most damaged by the proposed cuts. 2. Please circulate this petition to your family, friends, neighbors, and colleagues. DCPS process for allocating funds to individual schools. Copyright © 2017 Ruth4schools, All rights reserved. You are receiving this because you have been active in education issues in Ward 3, follow these issues, or have asked to receive my emails.